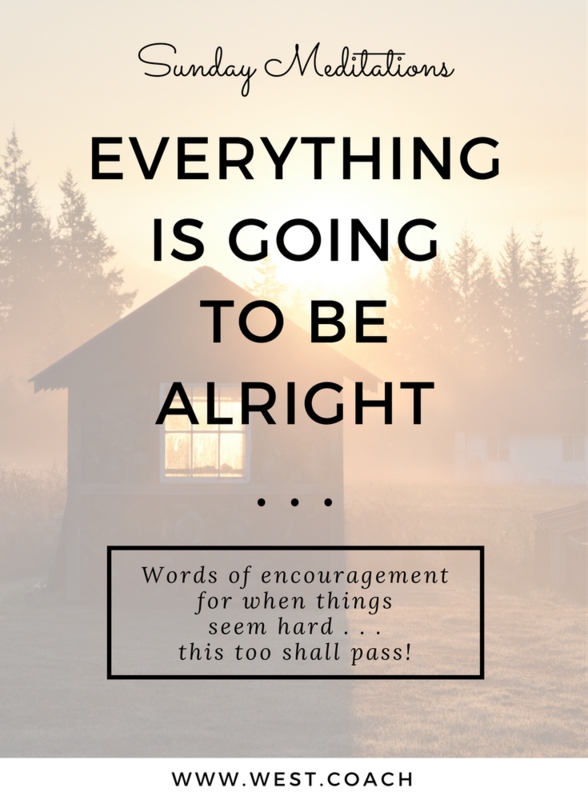 Sunday Meditations - Everything is Going to Be Alright . . .
As a Life Coach I frequently work with my clients to dissolve limiting beliefs and ​painful thoughts. I spent many hours practicing this technique during my training - both as "Coach", and "Client", and I have to say . . . most of the limiting beliefs I had were more annoying than painful. Which is all fine and well where practice is concerned, but it did not prepare me for the colossal meltdown that occurred this week - which was littered with really painful thoughts! OUCH! I didn't do a good job raising him. There's no time left to fix that. In Byron Katie's "The Work" - the first question we ask about the thought is "Is it True?" . . . and I know deep down that neither of these thoughts are true. AND, I am going to work and work and work on them until I turn them around! At the end of the day, I know in my heart that Everything is Going to Be Alright <--- it's just taking me a little while to get there. How are all of YOU doing this week? I don't have a journal prompt for you - I just want to remind you that whatever is going on in your life . . . Everything is Going to Be Alright. Do you have a child that is "leaving the nest"? Everything is Going to Be Alright. Are you feeling anxious about your work or a relationship? Everything is Going to Be Alright. Did you mess up something important or fall on your face? Everything is Going to Be Alright. To be transparent, I'm saying it just as much for myself as for you. Tomorrow when I watch my boy walk at graduation I will remind myself that my word for the year is TRUST . . . and that Everything is Going to Be Alright.